Genuine Blue Lapis inlaid between ribbons of Sterling Silver with Beautiful Fire and Ice Lab Opal Accents. The reverse side features a Contemporary Sterling Silver Design. Free 18" Sterling Silver Chain with Purchase of Pendant. 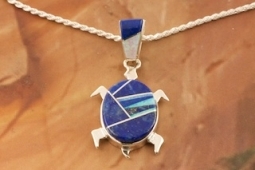 Turtle Pendant Designed by Navajo Artist Calvin Begay. Signed by the artist.